The Routledge Handbook of Clinical Supervision provides a global `state of the art' overview of clinical supervision, presenting and examining the most comprehensive, robust empirical evidence upon which to base practice. This authoritative volume builds on a previous volume, Fundamental Themes in Clinical Supervision, whilst greatly expanding its coverage. It contains nine updated and 25 entirely new chapters, focusing on both areas of contemporary interest and hitherto under-examined issues. Divided into five parts, it discusses:Education and training Implementation and development Experiences and practice Research activity International perspectives. 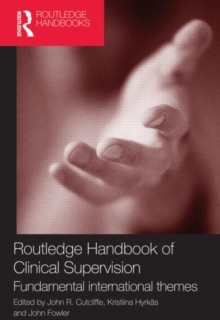 Containing chapters on Europe, the US, Canada, and Australasia, the Routledge Handbook of Clinical Supervision has a multi-disciplinary approach to clinical supervision and includes chapters relevant to nurses, doctors, psychologists, psychiatrists and counsellors. It will be of interest to students, researchers and practitioners of clinical supervision in a range of health professions.